Ronati | Power in simplicity. Growing your vintage, antiques and one-of-a-kind business can be challenging and at times, downright frustrating. We understand… and we’re here to help. We create technology-based tools that are simple and powerful, enabling you to make your incredible stock of unique pieces more accessible than ever to today’s buyers. The ECM is the first multi-marketplace tool created specifically for dealers and sellers of one-of-a-kind items. Built for speed and simplicity, you can add, edit and manage your listings across multiple qualified marketplaces from a single location. 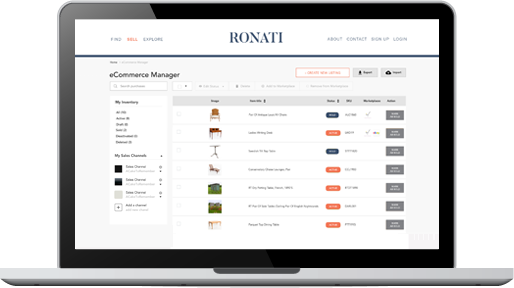 “Ronati has saved me so much time being able to sync my items and all their data to the other marketplaces from one location in Ronati. I finally have control of my inventory and syncing to other platforms! Everyone at Ronati has been so helpful and easy to work with. We are passionate about building solutions that meaningfully impact sellers of one-of-a-kind pieces. Our team is an inspiring group of professionals from multiple countries and industries, spanning antiques, design, technology, sales, marketing, social media and education. We collaborate with dealers of all specialties, locations and prices points to ensure our tools truly fit your needs. We are constantly inspired by the knowledge and passion you bring to your businesses, by the beauty, appeal and history of the pieces you bring to the world, every day. We are currently in a closed beta. If you are an existing dealer, please log in. If you've not received an invitation to join, we invite you to join our waitlist by completing the fields below. Yes, I would like to be kept up to date with Ronati. We will never sell or share your email address with others.